I started my kennel with Bea vom Dolderbrunnen, Anton’s dam. 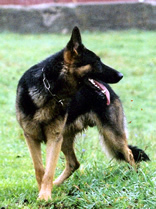 Bea is also sister to Bonnie, Vice Champion at the German National Herding Competition in 1997. 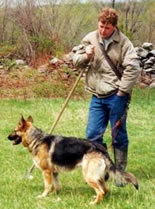 This kennel is a German Shepherd Dog kennel owned by Ulf Kintzel. It produces herding German Shepherd Dogs. Priority is a dog that is physically and mentally able to herd and tend sheep on a regular basis and in a reliable and consistent manner. At the same I try to breed versatile dogs. All of them are family companions as well. All of my pups are Guaranteed to be great with kids. I breed according to the SV requirements which means working title (HGH), qualifying hip and elbow rating and show rating. Anton vom Quasliner Moor. He is the best dog I've ever had. This dog is as reliable as it gets. He is Bea's son and the sire of Fiona.